Today at lunchtime, Diego and I agreed to meet on site, to spend a little time with the yard, to hear what it had to say. At the cafe, we bumped into Jess, who I seem to meet almost every time I come to the college. She’s very studious, which is commendable. Even more commendable is the fact that she’s at the college very regularly, and keen to get involved with the garden. So she came along with us for our first visit. At the cafe, we met Betty, the totally charming cafe lady. VERY keen to take part is Betty. She says she feels terrible throwing away the food scraps from the kitchen, and so will be an immediate supplier of compostables for the garden. We beamed at each other while she told me about her backyard in Marrickville (she grows an abundance of sugarcane! or rather, it grows itself!) and she promised to bring in a multitude of herb cuttings to get us started. All of this before we had even greeted our yard. We don’t know yet what will happen. On our current understanding, we have six months to get something rolling, working on a very part time basis. Our thinking right now is to tread lightly (rather than swoop in with something spectacular), to do a little each week and get some small results soon, allowing the yard to head in its own direction as it goes along. We don’t have total autonomy: especially in the early days, we’ll have to make sure the college is happy with our progress, but we hope that confidence and trust will be one of our early harvests. 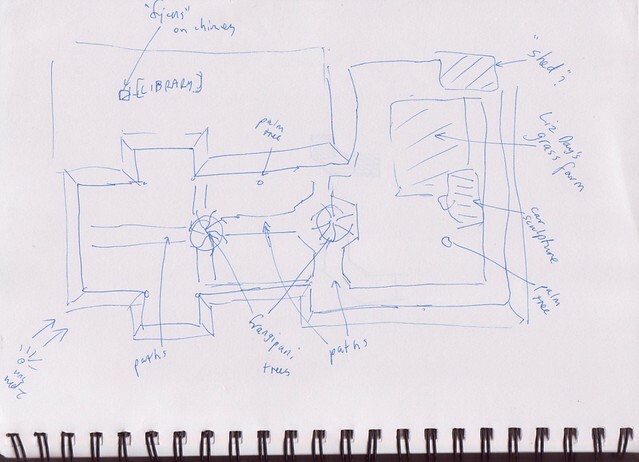 Above, here, I’ve put today’s sketch – “the yard as it is now”. Plenty of opportunity for rainwater harvesting from the corrugated iron rooftops; plenty of space, filled currently with ancient spongy kikuyu or buffalo lawn and flatweeds; plenty of sun, plenty of shade, depending which side of the courtyard you look at. There are some existing well-established trees – frangipani, palm trees mainly. There’s an old mercedes benz painted white; there is a “grass-farm” in the far corner, already being tended by artist Liz Day. 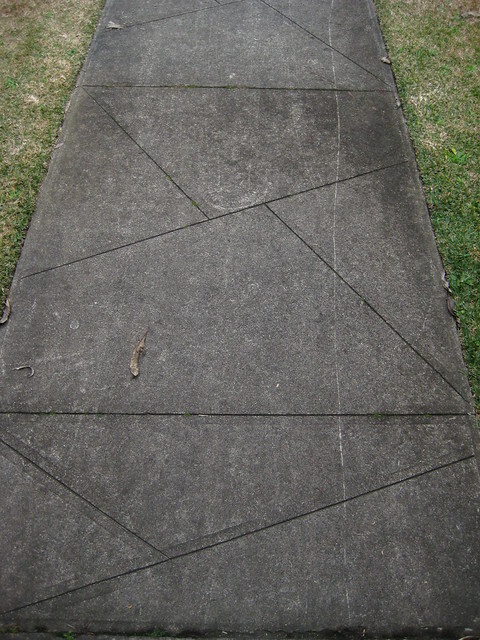 There are cute old concrete paths cast in hexagonal shapes; there’s an art library next door. There are a few taps for fresh water on site. And there’s a mouldy old shed in the corner!